I’d go back to Diego Garcia even just to order rice and bulgogi. I’d go back to the desert and start a day with a cup of Joe or chill with a frappe from Green Beans Coffee. I’d take another trip just to indulge myself for some Belgian chocolates, try their waffles once again and enjoy sipping on escargot’s broth. I can settle for another 6 months in Spain, have breakfast of Spanish Omelette and have dinner of paella. I’d take a long-been-missing vacation in Zambales and know that in every meal, there’s mango for dessert. I’d stay there for the entire summer knowing I can munch on their proud pastillas. Yes, I can even endure Mississippi, maybe for a day or two, simply to satisfy my curiousity once again to the taste of crawfish. I’d cherish another moment with Isabela kakanin. I’d get drunk again in Bourbon St. in New Orleans with hand grenades in both hands. Sure, if given the chance, I’d have another gulp of Baguio’s peddler food strawberry taho. Inevitably, I’d long for caffe italiano servito nel bicchiere piccolo. But if I were to choose between any of those, I’d skip all my world’s food travel in exchange of going to Vigan and getting a load of their authentic empanada. 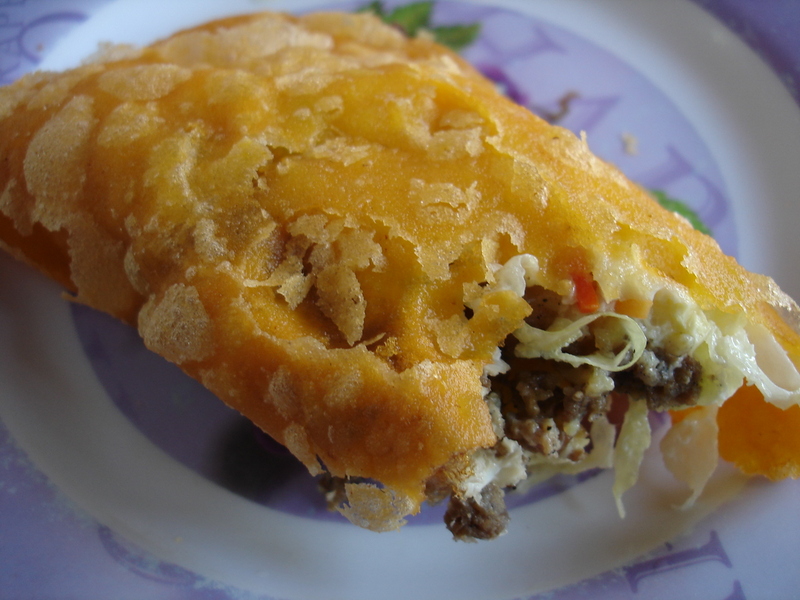 Nothing, ain’t nothing, can beat how much I crave for Vigan empanada…. But, yep, Vigan empanada (and garlic-ky longganisa) na may sawsawang suka is crave-able. If I ever go back there, knowing I crave so much about it now, I don’t think I’d ask for a Jollibee Champ. I know what it tastes like, but it feels like I’ve forgotten it … Arghh I’m craving for it! It’s your fault tita Buds. You made me re-read this post. Yes, you are so foul, arvee. Made me crave again looking at the picture.